← HAPPY BIRTHDAY TO US, #2! 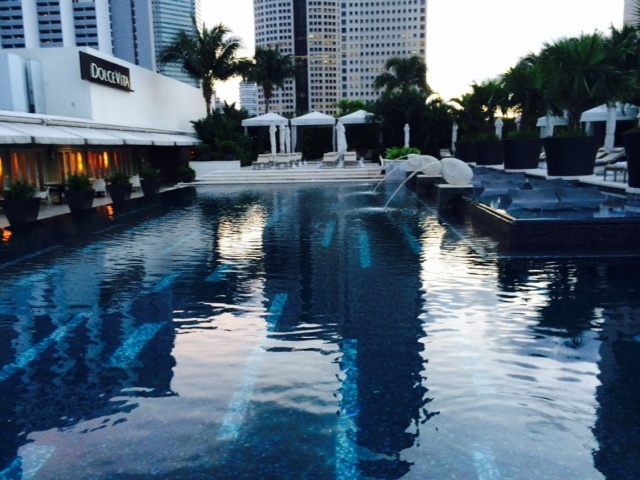 Here’s a reader swim pic from our International Textile Specialist pal ML from her recent visit to the Mandarin Oriental Singapore. The hotel is right on Marina Bay, with a view of one of the most famous hotel swimming pools in the world—The Marina Bay Sands. Pretty stiff competition for a hotel pool. But still, it looks pretty nice and according to ML, the view is beautiful. The website says it’s 25-meters with a separate children’s pool. ML says it was empty in the morning. And that the chaise lounges in the pool were nice. We always love those. Thanks ML. We hope to see more pool photos from your travels! More Hotel Pools in Asia.